Well this place was great, best colouring I’ve done since I was 5 haha! Allot of innovative products on display here for prospective buyers and distributors, then me the foreigner wondering around asking questions and apparently giving off some kinda big buying vibe as they quite liked to give me free samples. I even got offered a fish to take home! I was almost going to take him just for fun, then free him to the ocean before I realised.. Salt water would kill poor Ralph and the sink was no dignified home either. Also found the best crayon ever, it draws rainbows! I’ve never seen anybody in such impressive balloon clothing either, best I could make was a sword! So this evening I got to sit in on a business meeting where every month everyone in the department all has to pitch a new product all based around how creative they could get with stain glass. 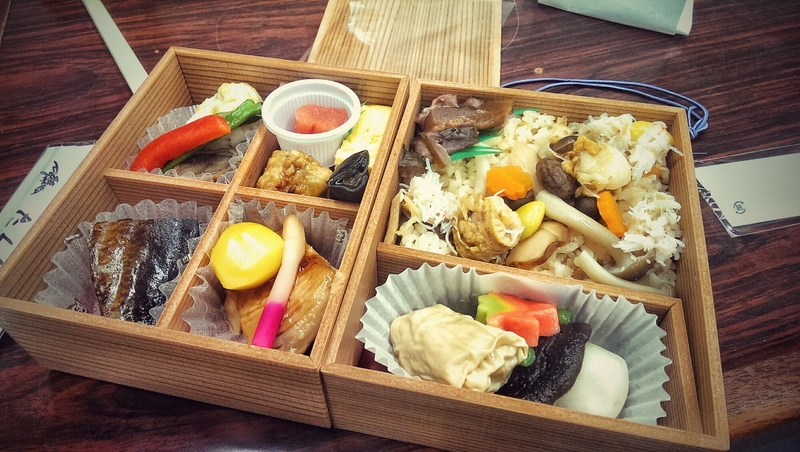 And in true Japanese style I had my first business bento box. Before the meeting they are delivered and everybody chows down on one of these. For me; it all being new it was pretty fun, again I love the style of lots of small things, lots to try, lots of colours, all presented perfectly. However with my lack of knowledge and unfamiliarity I found it to be a bit like a kid in a candy store mixed with Russian roulette, flavours are can definitely surprise you when you expect something else!